Spotted Pythons are one of the friendliest and shiest species of reptiles. 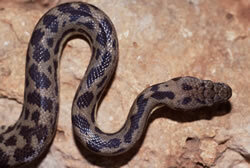 It is also commonly known as Eastern Small Blotched Python. 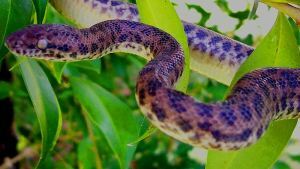 Their shy and friendly nature along with their non-venomous characteristic makes them one of the widely popular and a very friendly pet. This sleek and slithering reptile is very interesting to observe as well as pet. Size : An average adult Spotted python is 75cm to 1m in length. Some of the larger ones can also measure up to 1.5m. Appearance : Heads of the Spotted pythons are very different from their necks, than how it should have been. This species of snakes are of very solid built. 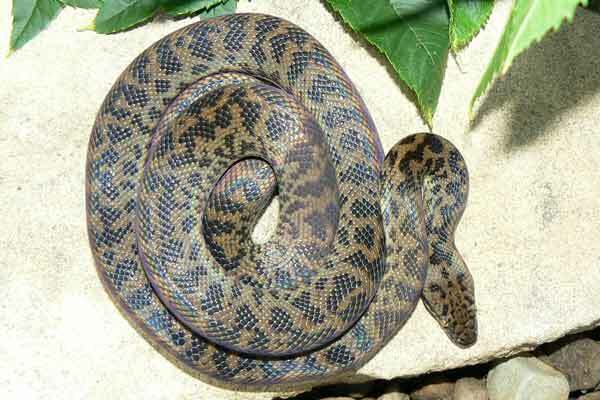 Skin : Skin of Spotted pythons are blotched and ragged at the edges, since dark pigmentation arises n complete scales only. Their body had about 37-44 rows of scales around their mid-body. Color : These snake species are found in blotched and irregular color patterns. They are mostly of dark brown, dark chocolate, pale brown, soil color, and many more varieties of brown color. Their underneath side of the body are cream in color. Spotted pythons are found in Australia. They range from Cape York Peninsula, in the extreme north, to eastern Queensland in the southern part to north of New South Wales. The species is found on the islands off-coast Queensland. Spotted pythons are very shy in nature. They can be friendly and come out of their shyness if treated well enough. They are anyway harmless species since they are non-venomous. Nascent spotted pythons do bite sometimes from their threatened defensive nature. But the grown up Spotted pythons are usually very docile in nature. They get nervous very quickly. Sign of a healthy Spotted python is if it sheds around once a month on a regular basis. The skin shedding process is a basic necessity of the growing procedure of snakes. The older they grow in age their physical growth rate decreases and so does their shedding frequency. If the snake is not shedding then that indicates malnutrition or any of the environmental discomforts and misfits. Malnutrition, improper humidity, too much of human handling, trauma, and skin bacteria can cause less shedding, which in turn affect growth of the species. A proper shedding will include eye caps also. If the eye caps do not shed, removing them very carefully with trained hands is advisable. When the Spotted pythons, or as a matter of fact any snake species, is about to shed, their eyes glaze milky white. A healthy shedding is when the skin comes out in one piece. The Spotted pythons feed on mostly small mammals, lizards, birds, etc. The insectivorous bats are one of the favorite foods of the Spotted python species. They have also been observed to diet on small rodents and mice. These bats reach the entrance to the habitat holes of these snakes in search of bugs and insects, and become prey to the snakes. Housing : The house should be ideally 1.5ft in depth, 4ft in width, and 1ft high in measurement. It should be provided with some furniture like stuff as Spotted pythons love to climb and play. An insulator is recommended to provide inside the glass house for the reptile. More than one small and humid hide-out is recommended for the reptile house for them to shed in ease. The hide-out should have holes for their entry and exit. Water : spotted pythons require fresh water around them all the time. A bowl should be provided with fresh water inside their glass house for them. They should be made feel as much comfortable enough as possible as in their natural habitat. Temperature : The glass house for Spotted pythons should be kept at a constant temperature between 88 to 90 Fahrenheit during the day and should be decreased by 5 degrees at night. The house should have enough amount of inside. Electrical apparatus should be strictly avoided in a snake house as that can cause burns to almost death to them. Feeding : Young Spotted pythons are good on hairless nascent mice diet. Adult pythons can be provided with grown up mice as their diet. Usually the reptile species feed on maximum 2 mice a week. A proper meal is measured as to weigh ten percent of the reptile’s weight. Maintenance : A calendar should be maintained to keep a track of their feeding frequency and their shedding frequency. Spotted pythons are very shy usually and prefer to stay within themselves. Their habitats suggest this trait of their nature. Rocky outcrops, dry forested areas, dry woodlands, frequented with ground timber areas are a favorite for Spotted pythons for inhabiting. They also inhabit in the rim regions of disturbed farmlands. Spotted pythons are known for their estivation along with the usual hibernation. Estivation is the hide out stage in summers as well. During the hibernation and estivation period the snakes sleep and their metabolic activities slow down. In the wild, it has been observed that the Spotted pythons live for about 20years to 30years on average. When bred in captivity their longevity depends on the care they are provided with. Spotted pythons are very good mothers. They are ovivaporous animals, those animals which lay eggs. Snakes are in general cold-blooded creatures. 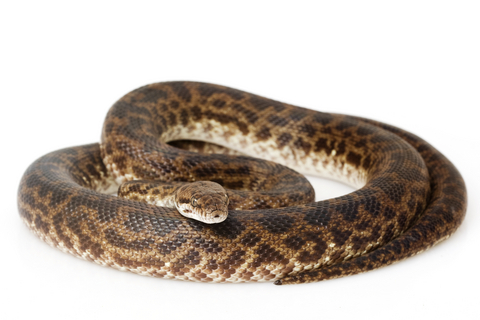 Their eggs require certain amount of heat to hatch which the cold-blooded snakes cannot provide on their own. Mother pythons twirl up around the eggs and never leave the eggs till they hatch. The mothers slither to some places to warm themselves up and come back to swirl up around the eggs and provide the necessary temperature to the eggs. Some spotted pythons shiver their muscles to produce heat and keep the eggs warm enough. They generate their own moisture to keep hydrating the eggs. The eggs take about 3months to hatch and the young ones come out. For that 3month long period the mother pythons stay twirled up around the eggs without even eating. Once the young snakes come out the mothers do not keep such an exhausting tab on them. Spotted pythons are a very interesting species. Here are some very interesting facts about it. • They are also called Eastern Blotched Pythons due to the blotch patterns on their skin. • The Spotted pythons hibernate as well as estivate. • Though the Spotted pythons prefer rocky mountain caves and deserted forest lands to inhabit, but they need moisture to shed. They also need fresh water around their range. • Due to their friendly nature they make a great pet. Spotted pythons are quite safe a species of snakes as of yet. They are unlikely to get endangered in near future, given their diet and environmental preferences. The exotic species of Spotted pythons are very popular as pets. Though they are not yet endangered let us all help keep them safe forever. If petting them then the care sheet should be followed in order to avoid any hassles to threaten their lives. Or even better let them be at mother nature’s care.